After some late juggling of the social diary, I was able to make it along the A4 to Newbury Racecourse to attend Colours 2008 last Sunday. Compared to previous years, it was a quiet show and I spoke to a couple of traders (it isn’t fair to name names) who’s takings were way down. Nobody seemed quite sure why. Perhaps the economic downturn is having an effect, perhaps it’s because the sun actually shone last weekend and people were taking their last chance to get out before Autumn sets in or perhaps (as in one case) there were difficulties with allotted stand space. As usual, I met up with Peter F. and, as we strolled round, I got the latest news on the vulcanizer and preparations for the Saxon range. At this stage, I don’t think I should go into details but the struggle continues. With luck, though, there might be some good news about at least one aspect of the trials and tribulations that have afflicted Calpe Towers this year. There was little to admire on the Napoleonic demo games front. The only exception being a demo participation game using the new Sharpe Practice rules. The set-up looked good with some well constructed scenery and a good smattering of enthusiastic young players. 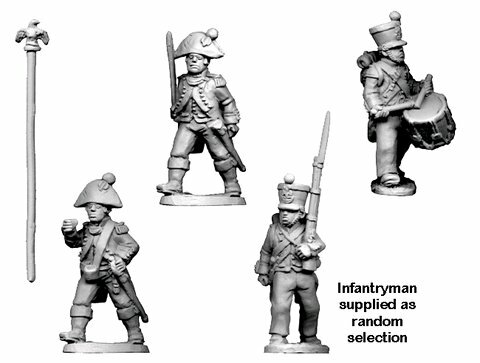 Dave Thomas had some of the new Crusader French Napoleonic infantry and they look really good in the flesh. I reckon they would fit well with late-Foundry figures and possibly even the Perrys output. The sculpting is in a smooth, flowing style that usually lends itself well to easy painting. I resisted the tempatation and settled instead for my first pack of Perry French cuirassiers. At some point I need to construct a single squadron of the 13th Cuirassiers, so I thought I’d try out pack of the “at rest” figures. There are some interesting painting challenges on these little chaps – mainly the regimental numbers on the end of the valises and the flaming grenade insignia in the corners of the saddlecloths. Hmmm, more candidates for my mythic wishlist of Napoleonic decals.